With its very attractive flowers that appear in large clusters in spring Kalmia latifolia is a wonderful shrub for the UK garden. This is the state flower of Pennsylvania where it grows in damp forested areas. 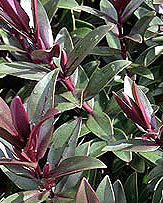 Also known as the 'Calico Bush' and 'Mountain Laurel'. Charming pink flowers although some deeper red, the more light they receive the more bushy the habit, if your plant is looking a little 'leggy' then it is lack of light. 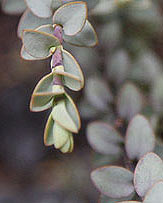 In dry conditions these plants require more shade. Kalmia latifolia Minuet is a low growing cultivar to around 1m with deeper complex pink and white flowers than the species, very attractive. Pink charm has plain pink flowers. Elf and Ostbo Red are others to look for. Pinwheel is a cultivar with wonderful deep red flowers spotted with white, a little more compact in growth than some others. 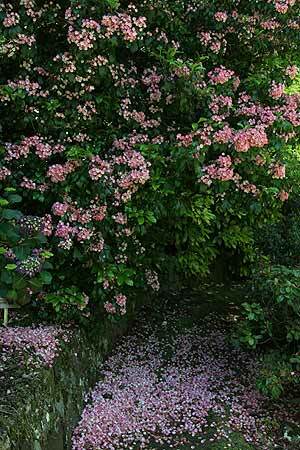 Planted high above a wall and growing beside a garden path, masses of flowers in spring make this an impressive sight. 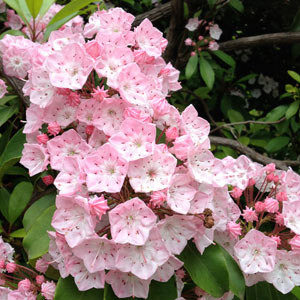 Also own as the Mountain Laurel, Kalmia latifolia is a slow growing plant that will reach around 3m (9ft) in height. Slow to flower when young it is well worth the wait, it is reported that a few cultivars will flower early such as Kaleidoscope and Sarah. 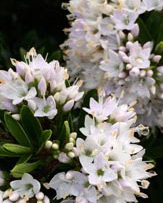 The foliage is a glossy green and in a part shaded position in a humus rich moist soil (slightly acid) Kalmia latifolia requires very little care. 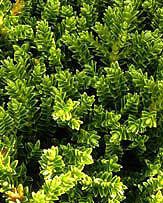 Pruning is generally not required, although a little judicious tip pruning can help create a more compact bushy shape. Some gardeners like to deadhead after flowering, we never have. A small family run nursery 600 feet up in the Scottish borders specialising in Hardy orchids, Meconopsis, Gentians, Hepatica, Trillium and many other unusual alpine and shade loving perennials. We specialise in mail order across Europe.